Here is another recipe that meets my requirements for a quick and healthy dinner: it has two ingredients, and is ready in under 20 minutes. It couldn’t be easier to prepare, but tastes like a gourmet dish. 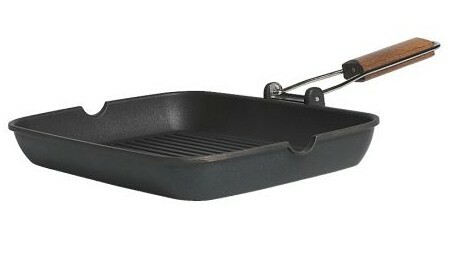 For light grilling like this one, I like using my Grilla pan from Ikea. It is perfect for grilling shrimp, a couple of chicken breasts, or some veggies. I buy peeled and deveined frozen shrimp, they defrost very fast. They can be thawed in just a few minutes if you put them in a bowl with lukewarm water. I served the shrimp with some tomatoes and green beans. Any frozen veggies, that can be prepared in the microwave, would also make a great speedy side. Mix 2-3 tablespoons of pesto with shrimp and let sit on the counter for about 10 minutes (you can start your side veggies at this point). Put 5-6 shrimp on a skewer. Preheat the grill pan on medium. Spray the grill pan well with cooking spray and grill the skewers for 2-3 minutes per side, until they turn opaque. I have been obsessed with pesto lately! I have made a batch and have been putting it on sandwiches, wraps, chicken breast, etc. Here is another great idea using pesto: Morgan, who writes her blog “Morganize with me”, shared this healthy pesto salad that is perfect for a quick and healthy dinner. Morgan has a ton of ideas for organizing your home and family life, as well as healthy living. Do you have a recipe that calls for pesto? I would love to add it to my list. I can’t wait to try this recipe! Thanks for the shout out too. 🙂 Go pesto!!! Hi Morgan! I have been also using pesto on pizza instead of tomato based sauce. It is my favorite right now. Have a great weekend! Two ingredients? I’m in! 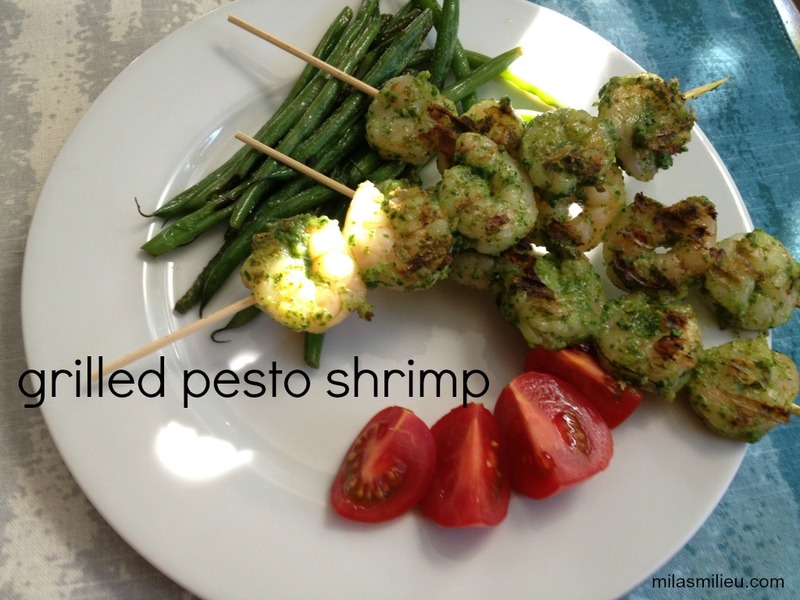 I love pesto, love shrimp, so it’s a no brainer! I don’t have a grill pan, but now that the weather is getting warmer, I can throw them on the grill outside. Mmmmmm! Yes, Amy, outdoor grill is even better. So glad warm weather is here! I love pesto, and I love easy! This looks yummy, Mila! Thanks for sharing at BOTW!